Are you in the market for a good, and reasonably priced shotgun for anything from duck hunting to trap shooting? 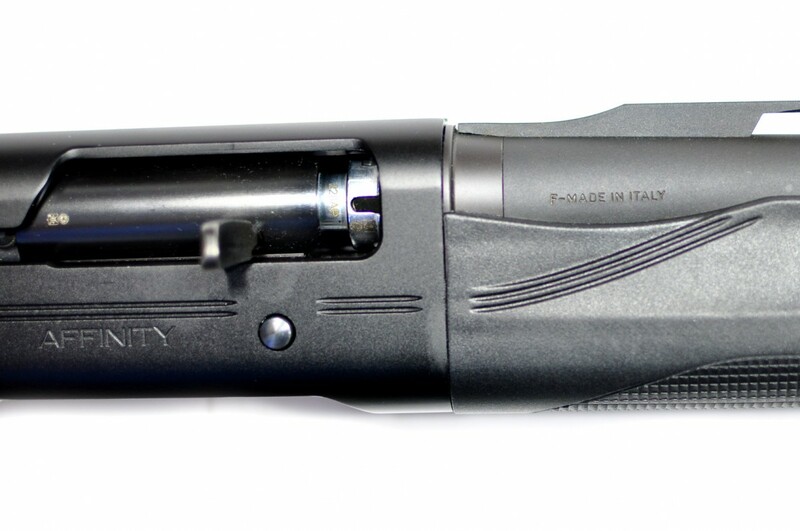 You should take a look at the Franchi Affinity series (MSRP: $849.00 – Black; $949.00 – Cammo). I wasn’t in the market for a new shotgun, but when I went to one of my local gun shops they happened to have one. I hadn’t seen a Franchi shotgun before; After about 5-seconds of holding it and shouldering it, I bought it. Franchi guns date back to 1868 where the manufacturing began in Brescia, Italy; in the industrial heartland of Italy. The first thing you notice about this shotgun when you pick it up is it’s weight; Weighing in at only 7 lbs, and feeling very well balanced, it’s one of the lighter shotguns in its class. I’ve found with it’s weight, it’s very easy to manhandle around and get on target fast! If you are engaging multiple targets you can also transition between them with ease. The Affinity series uses their Inertia Driven system, and it’s extremely simple and reliable (so their literature says). I’ve had no issues in the 2 cases of shells I’ve put through it so far, but I’ll let you know if I run into any issues further down the line. But, as far as a semi-auto shotgun goes, this thing cycles smooth and clean, so you can have rapid followup shots, and overall is just a great setup. This shotgun will handle 2 3/4″ and 3″ shells as well as slugs, so it should cover most needs… Just don’t try to stuff and 3 1/2″ magnum shells into it! For slugs, you can shoot rifled slugs using a Cylinder choke, but for Sabot slugs you will need to get a rifled slug barrel. With the shotgun you get 3 choke tubes (IC, M, F), and the tool to swap them out. They are easily changed without taking anything apart; they just screw into the end of the barrel. I patterned the gun using each of the tubes (I forgot to take pictures of them, so I’ll try to do a follow up on the different spreads if there is interest), and the chokes work as expected. I typically run with a full choke, but that just seems to work the best for me. The shotgun also comes with a “shim kit” for adjusting the stock drop and cast; I haven’t made the attempt to make any changes to that since the position it came in seems to work really well for me. But it is an option if you want to make any changes to the stock position. I’ve used Browning’s and other semi-auto shotguns that were double the price, and overall, they are a little nicer on fit and finish, but for the price point that this shotgun is at I think it’s a great deal and something that will last any shooter a very long time. Check one out at your local dealer, you’ll be glad you did.